An intellectual property lawyer who struggles with anxiety, depression and related issues. A Connecticut police officer with military-service-connected post-traumatic stress disorder. A New York City bus operator with delusional disorder and schizophrenia. What do these workers have in common? Well, in addition to being among the 40 million-plus U.S. citizens who experienced mental illness in the past year, they’re also part of a growing number of employees who are speaking out and ultimately suing when they feel mistreated on the job for having or being viewed as having a mental disability. It “could be anyone” in your workforce who’s affected by a mental health condition, management attorney Terri Gillespie told Bloomberg BNA. And situations involving workers with mental health conditions can be easy for employers to mess up, and costly when mishandled, she said. Gillespie is a partner in the Philadelphia office of Obermayer Rebmann Maxwell & Hippel LLP. Fortunately, the Equal Employment Opportunity Commission—which enforces federal workplace disability discrimination law—recently issued guidance that should help employers, workers and the medical profession navigate this “tricky area,” she said (see related story). Employers should also get to know consultants they can use when a worker seeks a mental-health-related job accommodation, Stephen P. Sonnenberg of management firm Paul Hastings LLP told Bloomberg BNA. Clients often ask about specific mental health conditions and whether they’re covered under the Americans with Disabilities Act, he said. Having access to a mental-health-care provider or similarly knowledgeable attorney is an effective shortcut to getting answers that can help to make sense of an individual worker’s situation, Sonnenberg said. He heads his firm’s New York employment law department and formerly practiced psychotherapy as a licensed clinical social worker. Employers also need to keep an eye on how other workers treat an employee with a mental illness, and how accommodating an employee with such a condition may adversely affect his or her co-workers, Orlando, Fla., management attorney Christina M. Kennedy told Bloomberg BNA. She’s a senior counsel with Foley & Lardner and a member of the firm’s labor and employment practice. The rise in discrimination claims brought by workers with mental health issues is undeniable. “All I’ll say is discrimination is our business, and business is good,” the National Disability Rights Network’s Cheryl Bates-Harris told Bloomberg BNA. She’s a senior disability advocacy specialist with the Washington, D.C.-based organization. A Bloomberg BNA analysis of EEOC charge statistics shows that the number of claims filed with the agency alleging bias based on a mental health condition or psychological disorder swelled to 23.3 percent of all disability-based charges filed in 2016. That’s a nearly 40 percent spike in mental-health-condition-based charges since 2006. Indeed, in announcing the December release of a publication on the job rights of employees and applicants with mental health conditions and a related fact sheet for mental-health-care providers, the EEOC said preliminary data for its 2016 fiscal year show it resolved nearly 5,000 charges of discrimination based on such conditions. The agency pulled in roughly $20 million from those resolutions, it said. Fears surrounding, and stigmas attached to, mental health conditions are driving such discrimination, Bates-Harris and other disability rights advocates Bloomberg BNA spoke with said. “Psychiatric disabilities don’t have a good name,” Bates-Harris said. Negative incidents involving people with mental illness get a tremendous amount of media attention, she said. She cited as an example an incident at an Oklahoma State University-Stillwater parade when a woman drove into the crowd, killing four people. Such incidents feed and perpetuate the misperception that everyone with a mental health problem has the same potential for violence, she said. As a result, there’s “a great deal of fear” among workers with mental health problems about disclosing their condition, Bates-Harris said. They may be afraid to ask for time off for medical appointments or to discuss job problems caused by their conditions, such as tardiness resulting from medication-related sleep problems, she said. That’s true even though mental health conditions lately have also received a lot of positive exposure in the media, with celebrities and others speaking out about their own experiences and struggles, Cyndy Miller, the legal director at NDRN member Disability Rights Iowa told Bloomberg BNA. She pointed to the late Carrie Fisher as an example. Kennedy cited Prince William and Princess Kate, Lady Gaga and former First Lady Michelle Obama, who spoke repeatedly about the need for society to let go of the stereotypes attached to mental illness so that those struggling with a condition feel free to come forward. A mental health condition typically isn’t readily apparent, so people have to disclose their problem if they want the help and support of an employer or others, Kennedy said. So the rub for workers is how to convey to an employer that they have a mental health condition without everyone else finding out, Miller said. Disability Rights Iowa counsels its clients not to share information about their condition in the lunchroom, for example, if they don’t want everyone to know, she said. For job applicants, it’s also important in most instances to make sure they already have the position they’re seeking “in hand” before disclosing their condition, Bates-Harris said. “That way, an accommodation” can help them keep the job once they get it, she said. But waiting to disclose a mental illness once on the job can be risky, Scott Lyon said. He’s a staff attorney with Disability Rights Iowa. If an employer doesn’t know about a worker’s mental illness and the employee engages in misconduct or has performance problems, the employer may discipline the worker even if the misbehavior or performance deficiencies were caused by the condition, Lyon said. A mental health disability disclosed during a meeting in which an employer is placing an employee on a performance improvement plan triggers the ADA’s protections going forward, but it doesn’t excuse past misconduct or underperformance, Miller said. And if the worker’s termination is the subject of the meeting, “that’s a problem” for the worker because he or she will have no ADA protection if the mental illness hasn’t been previously disclosed, she said. If an employee is consistently late for work because of medication taken to treat a mental illness, he can be terminated if he hasn’t shared that information with the employer beforehand, Disability Rights Iowa’s Executive Director Jane Hudson explained. Fears about disclosing a mental illness may sometimes be the product of a work environment where stereotyping is commonplace, Miller said. “We’ve heard about situations” involving the harassment of employees with mental health conditions by their co-workers, Hudson said. “Employers are supposed to stop such harassment immediately” and are liable under the ADA if they don’t, she said. Employers should avoid applying stereotypes to workers with mental health struggles and also resist the temptation to “play Dr. Google,” Kennedy said. Rather, they must look at what a worker’s medical provider has to say and what the worker’s job functions are, and come up with a practical solution, she said. Explore all potential accommodations, Kennedy advised. “It’s certainly not an easy process,” but it’s something employers can work through, she said. Co-workers likely will notice as more accommodation requests are granted, Kennedy noted. “So it’s a bit of a Pandora’s box” for employers. Employers must protect both the confidentiality of the accommodated employee and the morale of co-workers, she said. Employers can’t disclose an individual’s mental health status if co-workers ask why someone has limited duties, a schedule adjustment or some other altered work arrangement, Kennedy said. But they must also consider how any accommodation might burden other workers. Gillespie cited as an example a worker being allergic to a co-worker’s emotional support animal that’s allowed in the workplace as an accommodation for PTSD. 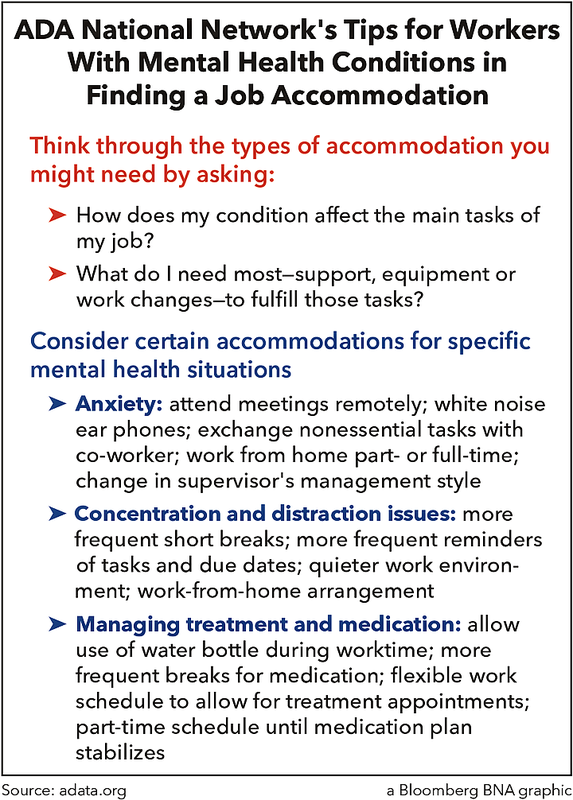 Hudson said the Job Accommodation Network is a “great resource” for ideas on how potentially to accommodate a worker with a mental health condition. Agreeing, Bates-Harris said JAN has put together excellent materials on the subject. “So answers are out there, and some are very simple,” she said. For example, adjustments to workplace lighting can sometimes help alleviate certain mental health symptoms, Bates-Harris said. “It’s a big thing” that the EEOC and the greater community are pushing to remove the stigmas associated with mental illness, Gillespie said. Even if it’s just a matter of the guidance popping up on a Google search by someone researching mental health issues and the workplace, “that’s good,” Lyon added. Employers should “presume employees will be increasingly comfortable” self-identifying as having a mental health issue and requesting reasonable accommodation for their condition, Sonnenberg said. “How do employers respond to the challenge?” Gillespie asked.